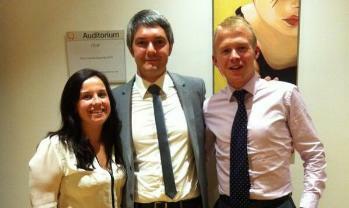 The Farm Safety Partnership, which NFYFC is a member of, launched a Stop! Think! 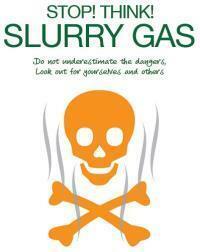 Slurry Gas campaign at the Grassland & Muck event and has issued a new leaflet for guidance. In the last ten years there have been ten fatal accidents involving slurry in Great Britain. Decomposition of slurry can release a cocktail of toxic gases including hydrogen sulphide. Even just a few breaths of the gas can render a person unconscious. The leaflet contains 11 points to help farmers plan and undertake work with slurry to help reduce the risk of an incident. It urges farmers to not put themselves at risk when there is an incident, if possible stopping the pump and getting a person to fresh air. 999 should be called immediately advising that slurry gas may be present. The work of the partnership ties in with the work undertaken by the Farm Safety Partnership in Northern Ireland and further materials are available to download from their website. For more information, download the guide from the NFU website here. Find out more about NFYFC's commitment to Farm Safety here. Young Farmers' Clubs are invited to take part in British Food Fortnight 2014 by creating a Harvest box that celebrates the food produced in their part of the UK. Each Harvest box needs to contain fruit and vegetables clubs have grown themselves and a selection of food from local producers in their part of the country. The boxes will play a starring role at the annual National Harvest Service, to be held this year in Birmingham Cathedral on the 20 October. Boxes might contain vegetables from your farm or allotment or herbs grown in windowsills and hanging baskets; delicious treats such as Harvest loaves or bramble jelly made using local flour or fruit you have picked yourself; and products from local cheese, meat and vegetable producers. Children will be invited to the National Harvest Service where the boxes will take pride of place. The display in Birmingham Cathedral will be admired by a host of VIPs and afterwards, the produce will be donated to a local charity. You can apply online to take part until the 24 July 2014 at www.lovebritishfood.co.uk, where you can also find plenty of ideas and tips on planning and producing your Harvest box. Your activities can take place in after school clubs, during activities weeks, at home, or as part of the curriculum. 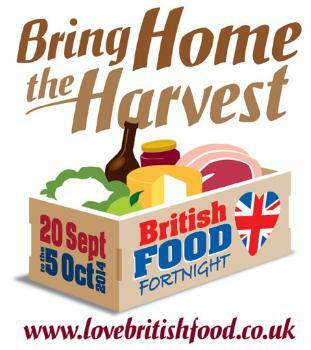 The National Harvest Service is part of the Bring Home the Harvest for British Food Fortnight campaign, which aims to bring together communities from across the UK to help rekindle the age old tradition of celebrating the Harvest, which is this year supported by Tesco. Last year the inaugural event was held in Westminster Abbey, and was attended by NFYFC and the 2012/13 Chairman of Council Milly Wastie read an address. How else can you get involved in Bring Home the Harvest? Bring Home the Harvest in your Community: In association with The Telegraph the search is on for the new Harvest Heroes - the communities that organise the most innovative, inclusive and imaginative harvest celebrations during British Food Fortnight. There’s a new category for schools and young people in 2014 - the winners of which will receive an action-packed gardening workshop with Chris Collins and cookery equipment from Tesco Home Range. Why not use the preparation of your Harvest box to create an event that your friends and family can join in with? #HarvestFever: With Farmers Guardian, we want to see you showing off your home grown produce during British Food Fortnight, with your funkiest “Harvest Fever” poses! Throw those shapes, use the hashtag #HarvestFever and nominate people you know by “Harvest Fever forwarding” to your friends on Facebook and Twitter. Don’t forget to tag @LoveBritishFood and @FarmersGuardian ! NFYFC is calling for the UK’s newly elected MEPs to support young farmers to provide sensible and workable agricultural legislation throughout Europe amid fears MPs may back down on Pillar 2. NFYFC attended the Council for European Young Farmers (CEJA) meeting in Brussels where concerns were raised that some member states may sacrifice measures in Pillar 2, such as start up grants for young farmers, believing that Pillar 1 offers enough support. “NFYFC is concerned that MPS may consider that Pillar 1 includes enough support for young farmers. Mandatory proposals under Pillar 1 will, in reality, only support a minority of young farmers. Major issues including access to land, access to credit and high establishment costs are huge barriers facing young producers, which this mandatory measure does not address. NFYFC wants to see the implementation of capital grants, training and investment to provide young farmers with the essential business skills needed to run profitable farming businesses. The CEJA Presidium meeting on 8 May also reviewed the efforts of the six working groups in 2013 and looked ahead to this year’s plans. New working groups were announced including themes of innovation, the food chain, international free trade agreements and access to land and credit. Charlotte said NFYFC’s attendance at these meetings was invaluable as other countries’ views could have a major impact on young farmers in England and Wales. “There was a lot of emotion in the room with regards to trade deals with other countries, particularly the US. Some CEJA members want to return to fully subsidised agriculture, including food banks, as they felt farming was more profitable like that. “We, as the EU, have moved a long way away from this. Suggesting such a shift in thinking is not only unrealistic, it would also be of huge detriment to the efficiency of English and Welsh agriculture. Not all policies that are proposed will favour English and Welsh farmers and so it is important for us to be there to be able to put our views forward. Membership of CEJA would not be possible without funding from sponsors Mole Valley Farmers and HOPS Labour Solutions. Poul Christensen has been re-elected as NFYFC’s President for a second year. Poul, who has been involved in the organisation for around 60 years, including time as a member, was voted in unanimously at the 82nd Annual General Meeting in Blackpool. After the AGM, Poul recorded the following message for Young Farmers and spoke about how impressed he was when members supported those affected by the Somerset Floods. A record number of young farmers attended Annual Convention 2014 at the Winter Gardens in Blackpool, with more than 5,500 people involved in activities over the weekend. Wristband sales prior to the event were already up on previous years and combined with on the door ticket sales the event was one of the most popular in recent years. Major competition finals in Entertainments, Disco Dancing and the Choir attracted coach loads of supporters to the seaside resort. Wales celebrated two victories in Entertainments and the Choir competitions. Llanbadarn Fynydd YFC came top in Entertainments with their performance of Just Chilled, and Glamorgan FYFC’s choir beat seven other clubs with their performance of Hallelujah and a Welsh folk song. In Disco Dancing though, it was Wigton YFC from Cumbria who were hailed the champs of the dance floor – the first time the club had ever made it to a national final. 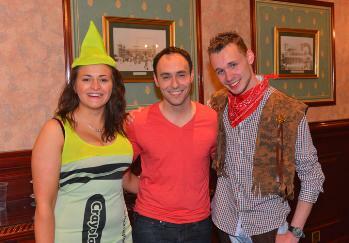 Members were treated to evening entertainment from five Radio 1 DJs over the weekend and three live bands. Jameela Jamil from Radio 1 got the party started on Sunday night, followed by Edith Bowman and Aled Haydn Jones on Saturday and Scott Mills and Chris Stark on Sunday. As well as the entertainment, the weekend also included NFYFC’s Agri Forum 2014 where leading industry speakers shared their advice on topics associated with technology and farming. David Gardner, Chief Executive of the Royal Agricultural Society of England, Professor Toby Mottram Founder of eCow and Campbell Scott from Massey Ferguson each gave a presentation and hosted workshops. The weekend also included the 82nd Annual General Meeting where Poul Christensen was re-elected as NFYFC’s President for a second year. 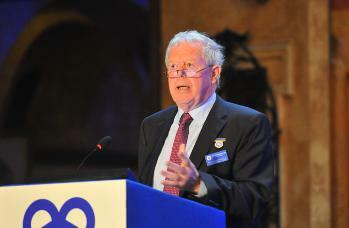 Members also agreed to increase the membership and associate membership levy by 20% for the first time in three years. Rachel Goldie, from Great Smeaton YFC, gave a supportive speech for the increase in the levy and won The Sidney Fawcett Trophy for her contribution to the meeting. The Senior Member of the Year was awarded to Jessica Wright from Lugg Valley YFC in Herefordshire for inspiring others to achieve. While trophies were given to the club and county who had raised the most funds for charity in 2013. There were also elections for two new Live Vice Presidents and one life member, as well as all the trophy presentations for achievements in 2013. Devon raised more than £100k last year for charity and won the Prince of Wales Trophy in recognition of their achievements, while Ivybridge YFC raised £18,000 and took home the Lionel J Hill Trophy for raising the most funds per member in the club. It is estimated that YFCs raised £1.2m for charity in 2013. Young Farmers support of local charities was praised during the weekend, with many clubs arriving in Blackpool on cycles after raising funds on their journey to the Convention. Catch up on all of the news and videos from Annual Convention 2014 over on the dedicated Convention website and see lots of photos on Facebook. Tell us what you thought of Annual Convention 2014 and you could win a wristband for the 2015 Convention in Torquay! Blackpool – are you ready? With less than seven days to go, excitement is mounting for what is set to be the biggest YFC event in recent years. More tickets have been sold in advance of the weekend than in the last 10 years, and with Radio 1 DJs performing every night, NFYFC is expecting even more wristband sales on the doors. On Sunday Young Farmers are also hoping to top the charts with the Essex FYFC single Put that Hoedown and it is hoped everyone will be performing the dance routine in the Empress Ballroom – including Radio 1 DJs Scott Mills and Chris Stark. Radio 1 DJ Jameela Jamil will DJ on Friday night, Edith Bowman and Aled Haydn Jones from Radio 1 will be playing to the crowds on Saturday night and Scott Mill and Chris Stark will hit the decks on Sunday night. Three live bands will perform including Tzars, Boomin and tribute act Killer Queen. National competition finals of NFYFC’s Entertainments, Choir, Disco Dancing and Senior Member of the Year will take place throughout the weekend. YFC Ski launch and a chance to win two ski holidays worth £399. Pub quiz, Darts Championships and Comedian Herbie Adams. As well as radio celebrities, leading figures from the world of agriculture will be joining YFC members at the Agricultural and Rural Issues Forum 2014, supported by Defra, which this year will discuss the topic of Young Farmers and technology – adapting farming for the future. NFYFC’s Annual Convention, which is sponsored by Massey Ferguson, returns to Blackpool for a second consecutive year and it will be the 22nd time it has been hosted at the seaside resort. To pre-order Put that Hoedown visit iTunes. 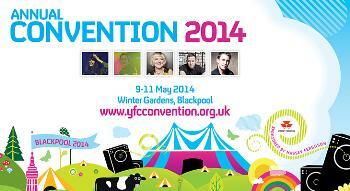 For ticket information, visit the YFC Convention website.